On Sunday May 25, 2008 at approximately 2:30 a.m. the Winnemucca Police Department was dispatched to the Players Bar and Grill located at 1062 South Grass Valley Road on the report of numerous shots fired and multiple gunshot victims. A combined law enforcement team consisting of Officers from the Winnemucca Police Department and Deputies from the Humboldt County Sheriff’s Office responded to the dispatch call and secured the scene. There were approximately 300 patrons in and around the bar. No shots were fired by law enforcement during the incident. The officers on scene discovered three adult males who had died from obvious gunshot wounds. Two additional gunshot victims were also located. One of these victims, a 34 year old male, was transported to Humboldt General Hospital via private vehicle. The other victim, a 22 year old female, was transported via Humboldt County Ambulance. Both of these injured parties were treated and admitted to Humboldt General Hospital in “stable condition”. Both victims have now been released from the hospital. The initial investigation indicated that there had been two separate shooters during the incident. One of the alleged shooters, Ernesto Fuentes Villagomez, age 30 of Winnemucca, was among the three men who were dead on arrival. The other was a 48 year old Reno man who was initially taken into custody at the scene as a person of interest. The subsequent investigation lead detectives to believe that Villagomez entered the bar and at some point began firing multiple rounds. At least two of these rounds struck and killed the other two decedents, Jose Torres age, 20 and his brother Margarito Torres, age 19 both of Winnemucca. At some point during this shooting spree Villagomez allegedly stopped and according to witnesses reloaded his high capacity handgun and began shooting again. After further investigation as well as ongoing discussions with Humboldt County District Attorney Russell Smith, the decision was made that the shooting of Villagomez by the Reno man was a justifiable homicide as outlined in Nevada Revised Statute 200.120 and 200.160. Because of this the Reno man was released from police custody. . . . . Thanks to Dave Del Buono for the link. Another delay in releasing Texas FLDS children to their parents. Wasn't it bad enough that the government had no evidence that the children in the FLDS compound were being harmed? Wasn't it bad enough that some of the mothers who had their children taken away because the mothers were claimed to be children were as old as 27 years old? After stinging rebukes by the appeals and state Supreme Courts, it looked like the children would finally be released to their parents. As it was, the parents were being forced to agree not to leave the state and allow further investigations by Child Protective Services. But now the district court judge is just being obnoxious and will not release the children until all the parents have signed the agreement form, even though that will add days to the release of the children. Obviously, the judge could have released children to their mothers after the mothers had signed the forms, but instead the judge choose this delaying tactic. Walther had wanted to add restrictions to the agreement worked out by the parents' attorneys and Texas Child Protective Services, but the parents' attorneys argued that she didn't have the authority. The judge then said she would sign the initial document, but only after all 38 mothers involved in the case the high court ruled on signed it first. State officials had said earlier that children could start being returned Monday, but attorneys for the parents said the new requirement could add days to the time frame. The high court on Thursday affirmed an appeals court ruling ordering Walther to reverse her decision last month putting all children from the Yearning For Zion Ranch into foster case. The Supreme Court and the appeals court rejected the state's argument that all the children were in immediate danger from what it said was a cycle of sexual abuse of teenage girls at the ranch. . . . This story from CBS is very shocking. The title of the report says it all: "Police Report Lies Were Encouraged." Indicted Chicago police officer Keith Herrera says his superiors knew and encouraged him to lie on reports so questionable arrests would stand up in court. Herrera and six fellow SOS members were charged with crimes including armed robbery and aggravated kidnapping - many against suspected drug dealers. They have all pled not guilty. They are also accused of routinely lying on police reports. "Creative writing was a certain term that bosses used to make sure that the job got done," he says. His bosses, says Herrera, wanted the cases to stick in court. "I didn’t just pick up a pen and just learn how to [lie on reports]. Bosses, guys that I work with who were older than I was…It’s taught to you," he tells Couric. The SOS mission was to get drugs and guns off the street, he says, "at any cost." Getting the job done often entailed breaking the rules, says Herrera. He describes to Couric a hypothetical scenario where to make a case stick against a gunman who tossed his weapon, a cop would lie in the police report and say that the gun never left the man’s hand. "Do you want that guy…that just shot somebody to not go to jail because he threw the gun? Or do you want him to go to jail because he never let the gun out of his hand?" asks Herrera. "I know what I’ve got to do." Well, at least Clinton has a strong vote among those in jail in Puerto Rico. At the end of his show yesterday, Rush said that today he was going to discuss the piece that I had that came out on Monday. 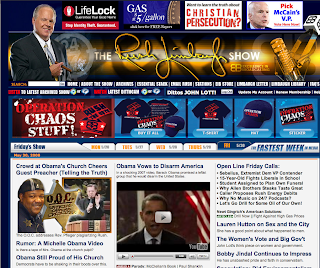 Rush spent about 12 minutes on the piece today reading it and making useful comments. The transcript of his discussion can be found here. . . . . Many are trivial, such as his suggestion this month that America has 57 states, and his bizarre statement in a Memorial Day speech in New Mexico that America's "fallen heroes" were present and listening to him in the audience. Some gaffes involve mangling his family history. Last year in Selma, Ala., for example, he said that his birth was inspired by events there which took place four years after he was born. While this gaffe can be chalked up to fatigue or cloudy memory, others are more substantive – such as his denial last April that it was his handwriting on a questionnaire in which, as a state senate candidate, he favored a ban on handguns. His campaign now contends that, even if it was his handwriting, this doesn't prove he read the full questionnaire. Mr. Obama told a Portland, Ore., crowd this month that Iran doesn't "pose a serious threat to us," saying that "tiny countries" with small defense budgets aren't much to worry about. But Iran has almost one-fourth the population of the U.S. and is well on its way to developing nuclear weapons. The next day Mr. Obama had to reverse himself and declare he had "made it clear for years that the threat from Iran is grave." Last week in Orlando, Fla., he said he would meet with Venezuelan dictator Hugo Chávez to discuss, among other issues, Chávez's support of the Marxist FARC guerrillas in Colombia. The next day, in Miami, he insisted any country supporting the FARC should suffer "regional isolation." Obama advisers were left explaining how this circle could be squared. In a debate last July, Mr. Obama pledged to meet, without precondition, the leaders of Iran, North Korea, Syria and Cuba. He called President Bush's refusal to meet with them "ridiculous" and a "disgrace." Heavily criticized, Mr. Obama dug in rather than backtrack. He's claimed, in defense of his position, that John F. Kennedy's 1961 summit with Soviet leader Nikita Khrushchev in Vienna was a crucial meeting that led to the end of the Cold War. Not quite. Kennedy himself admitted he was unprepared for Khrushchev's bullying. "He beat the hell out of me," Kennedy confided to advisers. The Soviet leader reported to his Politburo that the American president was weak. Two months later, the Berlin Wall was erected and stood for 28 years. . . . The Constitutions written "20 centuries" ago (when he nominated Sonia Sotomayor). Obama thinks that Europe is a country. "Halt the rise of privacy"
July 22, 2008: "Israel is a strong friend of Israel." Breathalyzer used to treat asthma? There is much to celebrate from the FBI's first 100 days? Biden messes up the oath of office for the Senate. Even the often inaccurate Michelle Malkin has a few examples. * And in perhaps the most seriously troubling set of gaffes of them all, Obama told a Portland crowd over the weekend that Iran doesn’t “pose a serious threat to us”–cluelessly arguing that “tiny countries” with small defense budgets can’t do us harm– and then promptly flip-flopped the next day, claiming, “I’ve made it clear for years that the threat from Iran is grave.” . . . The person who fired a single shot, wounding three people, was ineligible for having a permit. The man accused of opening fire at Seattle's Northwest Folklife Festival, wounding three people, had obtained a concealed-weapon permit from the Snohomish County Sheriff's Office even though federal and state laws should have prevented him from having one. Clinton Chad Grainger, 22, has been on a methadone program for drug addiction since he was 18 and also has a "history of anxiety and mental illness," according to King County Superior Court booking documents. Federal and state law prohibits people with mental illness or drug addiction from obtaining a concealed-weapon permit. Grainger, who lives in Snohomish with his father, went to the Sheriff's Office and completed a state concealed-pistol license application, said sheriff's spokesman Capt. Kevin Prentiss. The permit asks applicants whether they have spent 14 days or longer in a mental-health facility and requires them to sign a waiver allowing police to look at mental-health records. Buckeye Firearms Association applauds the Ohio House Criminal Justice Committee’s 9-3 vote to pass the amended SB184, Ohio's Castle Doctrine legislation. SB184 passed the Ohio Senate in April with a 31-0 vote. Before being voted out of committee in the House, it was amended to include technical corrections and improve laws for law-abiding gun owners in Ohio. The amendment provides a legal way for a person who does not have a concealed handgun license to transport an unloaded firearm in a motor vehicle. It allows a concealed handgun licensee to pick up a child from school, to carry a concealed firearm in one's own home without a license, to carry concealed in places such as grocery stores that sell alcohol for off-site consumption, to carry concealed in publicly-owned facilities such as park shelters, parking garages, and highway rest stop buildings, and to carry in an unlocked, closed glove compartment or center console. The amendment also eliminates the written test to re-qualify for a Concealed Handgun License (CHL), defines a "loaded" firearm more clearly, provides for mandatory attorney's fees when police fail to return a firearm to its rightful owner, lessens th penalty for failure to inform a police officer of one's status as a CHL-holder if the officer had actual notice of the CHL, and prevents a landlord from evicting a tenant because they lawfully own and/or carry a firearm. . . .
Short version: cops invaded this guy's house with a SWAT team based on an informant. Turns out the informant had burgled the guy's house a few days before. Informant told cops guy was growing pot in his detached garage. Actually he was growing japanese maples. For some reason cops thought they'd kick down his front door. He didn't know they were cops and fired. Guy may have been scared due to recent burglary. They are charging him with first degree murder. in many cases, immediately after the bulb was broken - and sometimes even after a cleanup was attempted - levels of mercury vapor exceeded federal guidelines for chronic exposure by as much as 100 times. Mayor David Miller wants to close recreational shooting ranges in Toronto, along with giving the city power to block gun manufacturers and wholesalers from opening new plants or warehouses. "Nobody can deny that hobby directly results in people being shot and killed on the streets of our city," Miller said of sport shooting yesterday, amid debate on a possible gun bylaw. Canadian Olympic pistol shooter and downtown resident Avianna Chao begs to differ. She says that if Miller gets his way, it could mean an end to her sport – and it won't make the streets one bit safer. Miller wants to terminate leases with two gun clubs that have shooting ranges on city property, one at Union Station, the other at Don Montgomery community centre. . . . .
New Op-ed at Fox News: Is There Really a Bias Against Women in Politics? Are women really discriminated against in politics? Sen. Hillary Clinton surely thinks so. Indeed, she believes this year's presidential campaign has shown that sexism limits women's influence in politics. She claimed last week that "every poll I've seen shows more people would be reluctant to vote for a woman [than] to vote for an African American." It's possible that Democrats are particularly sexist, but with women making up the majority of voters, one would think that politicians were ignoring women at their own peril. . . . .
Philadelphia had 406 homicides in 2007, and, at 28 per 100,000 people, it also had the highest murder rate of any major city in the United States. No wonder Philadelphians want things done. Recently, the city focused on a new tragedy, the murder of a 12-year police veteran and father of three, Sgt. Stephen Liczbinski, by three bank robbers with long, violent criminal records. To Gov. Rendell, Mayor Nutter, Police Commissioner Charles Ramsey, and freshman U.S. Rep. Joe Sestak, the solution is simple: more gun control. 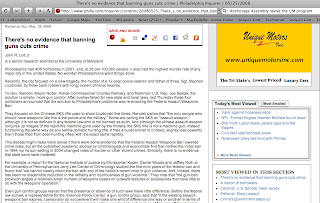 After pushes failed for new state and local laws, last Thursday these four politicians announced that the solution to Philadelphia's problems was re-enacting the Federal Assault Weapons Ban.. . . .
UPDATE: The article was the most viewed opinion piece on the Inquirer website.